Entrée: $20-30 per pie. Fresh tasty pizza with a Hawaiian twist. Try creations like wild pig with kalua pork or goat cheese. If the whole pies are too expensive or too big try single slices for $5. Entrée: $12-26. Small but modern Mediterranean tapas bar with a large lanai in a tropical setting. Both the menu and wine list aren’t extensive but delicious. Entrée: $25. Fish market, sushi lounge and restaurant at the entrance of Hanalei. Fresh and flavorful seafood in a beautiful but busy setting. Entrée: $5-12. 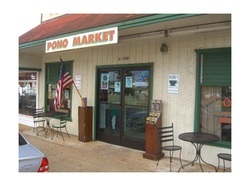 If you are looking for outstanding poke or delicious Hawaiian plate lunches and sushi you shouldn’t miss Pono. Be aware that you are not heading to a restaurant but a super market that contains an awesome food counter! Give the fried chicken and poke a try and order a take out or have the food onsite. If you cannot decide the super friendly staff lets you sample all dishes. Entrée: $22-30. If you are looking for a more upscale dining experience off the common hippy cafes and bars around Kapaa you should try The Eastside. The casual restaurant serves upscale Hawaiian dishes with a modern twist in the center of Kapaa town with live music during dinner. Entrée: $19-32. Located within a historic plantation the restaurant serves upscale farm fresh American fare made with local produce. Try to get a table inside (though the outdoor setting is beautiful) since this assures that you are not beaten up by mosquitos! 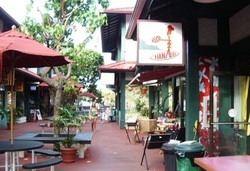 The restaurant is located next to the shopping center in Poipu. 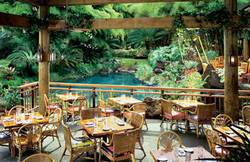 I highly recommend choosing the bar/grill over the restaurant since you will sit outside next to a tropical garden. Usually they have live music for dinner and typical bar food. Sandwiches: $6-10. The Deli is a great place for breakfast and lunch. Their rolls are incredibly fresh and the sandwiches tasty. Besides, their prices are bargains for the area. Entrée: $8-10, poke $11 per pound. No seating and cash only environment but you get great local plate lunches, fresh fish, and poke. Be aware of their opening hours! Mon-Fri until 6pm, Sat until 5pm, Sun closed. Come early to get the best poke or fish to grill at home. Entrée: $11-12. Choose between 6 different styles of shrimps, a shrimp burger and shrimp tacos. All of them are tasty and inexpensive. You only have to come early since they close around 5pm! Entrée: 10-20. Small brewing company with a nice selection of beers and common pub food. The very casual restaurant is located next to Waimea Plantation Cottages and you can overlook the beautiful setting from the deck.